The lack of qualified teachers is the greatest challenge currently educational systems in developing countries face. According to UNESCO, in 2015 more than 1.7 million teachers will be needed to achieve universal primary education. The shortage of well-trained and motivated teachers is of particular concern in Africa, particularly in sub-Saharan Africa, where 902,000 additional teachers are needed to meet that goal. According to experts, the current teacher education programs have not generated a gifted faculty necessary for effective teaching work skills. In many cases, the quality and equity in order to increase enrollment sacrifice. Clearly, therefore, the need for further work in training teachers, not as key elements of the education of children, but as levers for development of the most disadvantaged communities in the South. 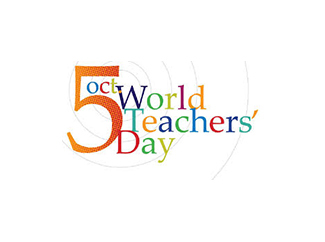 This Sunday October 5th is celebrated worldwide on World Teachers' Day, under the theme 'Invest in the future, invest in teachers'. Beyond the extensive calendar of upcoming events, this event should serve, first, to emphasize the importance of teacher training in education and, second, to claim their role as engines of progress. 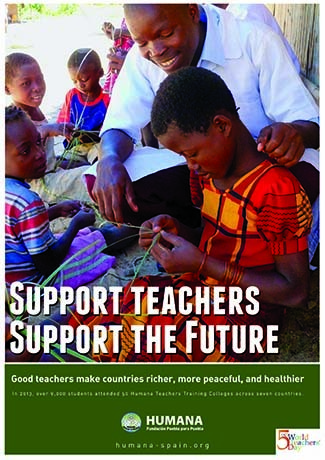 Humana People to People today promotes teacher training through 50 Teachers Training Colleges in seven countries. Annually 3,000 graduate teachers and teachers in these schools. 80% choose to practice in rural areas, helping to improve the quality of education in areas often neglected by national education systems. Also, driving schools female empowerment. Earlier this year saw the first group of graduates from the two-year teacher training program at Humana Congo’s new DNS College in Mbankana. A total of 30 newly qualified young people are now ready to begin teaching in rural primary schools next month, providing several villages with desperately needed, well trained teachers. But it hasn’t always been this way. 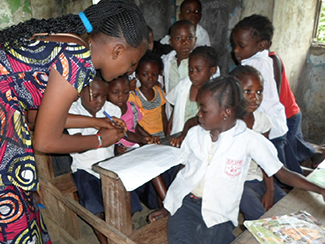 Noelly is a member of DNS Mbankana’s first student teacher intake in 2012, during the school’s trail phase. It took several months in the program before she realised that girls hardly ever answered questions or contributed to discussions in class. With the support of her professors, she spoke with her female class-mates, and together they decided to make the effort to contribute more in their program and support each other. It was not easy to change the prevalent attitudes of their male colleagues. To begin with, Noelly and other girls faced tough resistance, and comments such as “Do you think you’re a boy?” and many male students in the program refused to carry out “women’s” tasks, such as collecting firewood. With the support of DNS staff, such issues were raised with the entire class and expectations were set out. Although these new norms were hard for many to accept, slowly but surely, the environment changed for the better. By the end of the course, attitudes on both sides had been challenged and all students, both male and female, were more aware of the importance of gender mainstreaming in education and community development.